Bermuda – officially, the Bermuda Islands or the Somers Isles – is a British overseas territory in the North Atlantic Ocean. Located off the east coast of the United States, it’s situated around 1,770 km northeast of Miami, Florida and 1,350 km south of Halifax, Nova Scotia. Although usually referred to in the singular, the territory consists of approximately 138 islands, with a total area of 53.3 km². The largest island, Main Island, is sometimes itself called Bermuda. 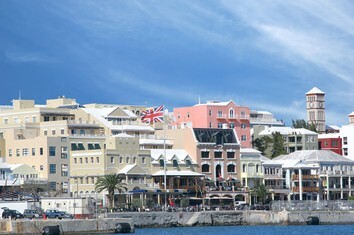 As a result of its low direct taxation on personal or corporate income, Bermuda is an offshore financial centre. The local tax system is based upon import duties, payroll taxes and consumption taxes. The country’s legal system is derived from that of the United Kingdom, with recourse to English courts of final appeal. English; the other language is Portuguese. Bermuda Dollar. The Bermudian dollar is not normally traded outside of Bermuda. 110/120 volts, 60 cycles, the same as in Canada. You can find high end designer clothes in the shops and the prices are comparable to those found in Canada or the US, just minus the sales taxes – so, there aren’t any great bargains. However, best buys are on goods imported from Great Britain and Europe, such as china, crystal items, woolens and linens – particularly in the spring when the stores are clearing out their winter inventory. The climate is humid and, as a result, the summertime heat index can be high, even though mid-August temperatures rarely exceed 30°C. Winters are mild, with average daytime temperatures in January and February around 20°C, although cold fronts, which dominate the local weather for most of the year, can bring Arctic air masses that can result in rapid temperature drops. The Gibbs Hill Lighthouse is the first of only a few lighthouses in the world to be made of cast-iron. The hill that it stands on is one of the highest on the island. The lighthouse has 185 steps to the top in eight flights. Until 1964, most of the light was run by hand, but in June of that year, the whole system was automated and runs on electricity. Originally opened in 1898 the Bermuda Botanical Gardens feature 36 acres of trees, flowers and shrubs. All are clearly labelled making it the place to come if you want to identify the fantastic flora you have seen on your Bermuda vacation. John Lennon visited the gardens in 1980 and named his subsequent album ‘Double Fantasy’ after a flower he spotted here. Crystal Cave is the most famous of Bermuda's many subterranean caverns. It is located in Hamilton Parish, close to Castle Harbor. A tourist attraction since 1907, it was discovered in 1905 by Carl Gibbons and Edgar Hollis. An excursion to Crystal Cave also includes the neighboring Fantasy Cave. HMD Bermuda (Her/His Majesty's Dockyard, Bermuda) was the principal base of the Royal Navy in the Western Atlantic between American independence and the Cold War. It wasn't until the loss of bases on most of the North American seaboard that the Island assumed great importance as a naval base. Church Bay is a rather small piece of beach on Bermuda's south shore. Its deep pink sands are a unique site that appeals to sunbathers, while a line of offshore reefs make this beach a remarkable swimming and snorkeling area. A variety of colorful coral makes up the reef drawing all kinds of marine life for visitors to view in the water. Elbow Beach is one of the most popular beaches on the main island of Bermuda. Located on the southern (Atlantic Ocean) coast of Paget Parish, it is also home to one of Bermuda's most famous resorts, the Elbow Beach Hotel. Part of the beach is privately owned by the hotel for use by its guests; there is public access to the rest of the beach. The Bermuda Aquarium, Museum & Zoo is a facility located in Flatts Village, Bermuda. It was established in 1926 by the Bermuda government to enhance a growing tourism industry. The facility focuses on showing oceanic island species and contains an aquarium, a natural history museum, and a zoo. St. George's was the first permanent settlement on the islands of Bermuda, and was the third successful English settlement in the Americas. Only below ground achaeological remains of the town exist today. St. George's is not simply the oldest successful English settlement in the New World, but was also the first such town established. St. Peter's Church', in St. George's, Bermuda, is the oldest surviving Anglican church outside the British Isles. It is also reportedly the oldest continuously used Protestant church in the New World. A UNESCO World Heritage Site , St. George's Town is the oldest surviving English settlement in the New World.